Shaolin Temple (Shao Lin Si in Chinese) is located in Dengfeng County, Henan Province, China. It is the birth place of the renowned Shaolin Wushu (Shaolin Martial Arts). "Shao" in "Shaolin" refers to "Shaoshi Mountain", which is in the west of the Songshan Mountain Range and serves as the backdrop of Shaolinsi; "lin" means "forest" or "woods", and si "temple". 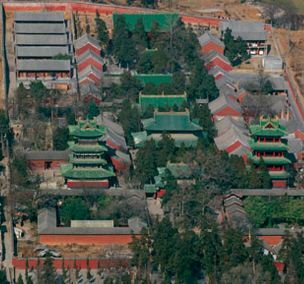 The name of Shaolin Temple literally means "temple in the woods of Shaoshi Mountain". Shaolinsi was established in 495 A.D. Emperor Xiaowen of the Northern Wei Dynasty (386-557 A.D.) had the temple built to accommodate the Indian master Batuo (Buddhabhadra). As the first Shaolin abbot, Batuo (Buddhabhadra) devoted himself to translating Buddhist scriptures and preaching doctrines to hundreds of his followers. Later, another Indian monk Bodhidharma arrived at Shaolinsi, who was said to have crossed the Yangtze River on a reed. Bodhidharma spent nine years meditating in a cave of the Wuru Peak and initiated the Chinese Zen (Chan Zong) tradition at Shaolinsi. He was honored as the first Patriarch of Chan Buddhism. 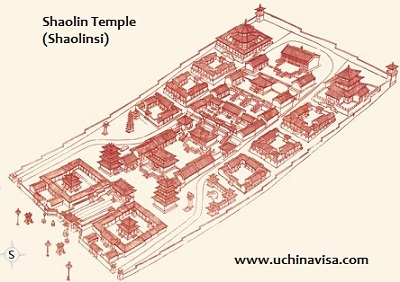 The ancient architectural complex of Shaolinsi comprises seven main halls on its axis, flanked by several buildings on each side. It is 160 meters (525 feet) wide and over 360 meters (1181 feet) long, covering an area of 57,000 square meters (613,542.9 square fseet). The monks live and deal with daily affairs in the temple. The Pagoda Forest at Shaolin Temple stands at the foot of Shaoshi Mountain about half a kilometer west to Shaolinsi. 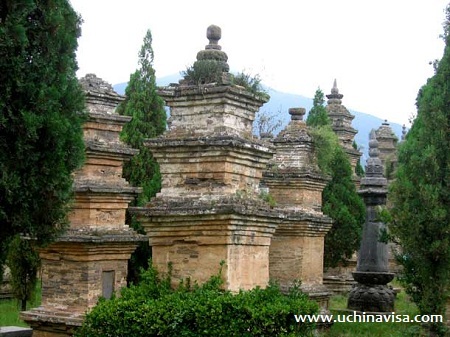 It is a concentration of tomb pagodas for eminent monks and abbots of the temple. A rough count shows more than 240 tomb pagodas of various sizes from the Tang, Song, Jin, Yuan, Ming and Qing dynasties (618-1911), making it the biggest pagoda forest in China. Most of the pagodas are stone and brick structures, ranging from one to seven stories, less than fifteen meters high; and they all carry the exact year of their construction as well as many carvings and inscriptions. Their shapes are varied, including polygonal, cylindrical, vase-like, conical and monolithic, making the pagoda forest an exhibition of ancient pagodas, carvings and Chinese calligraphy of various dynasties. 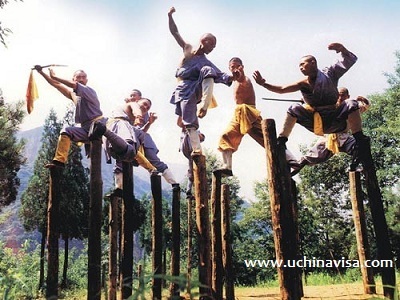 Shaolinsi is also the birth place of the influential Shalin Wushu (Shaolin Martial Art). Find out which visa type you need to see Shaolin Temple and if you are eligible for China's visa waiver program. Here you can find out how much your money is worth in China.